The simple fact about memory foam and latex mattresses is that they look incredibly simple to design, but, in reality, are very difficult to get right! Some would say its a piece of cake! Anyone can stick a few layers of this and that together, but you need to fully understand the materials, benefits, drawbacks and science behind it to get it right. That’s where we come in. The general rule is that a mattress should start off at its firmest at the base and then each layer should get progressively softer, until the topper layer. This allows for progressive comfort and enables the mattress to support you as you sink into each of the layers. If the mattress is too soft for your weight, you will sink quickly down to the firmest layers resting solely on the supportive base. If the mattress is too firm you will simply sit on the top layer without benefiting from the other materials. Both scenarios result in an uncomfortable mattress. The correct mattress will allow you to sink into the layers and equalise, i.e. it is holding, supporting and comforting you just at the right level, not sinking too deep, not resting too high. Most foam mattresses rely on reflex foam as the ‘support’ layer which is the white foam in the above image. Some foam mattresses may use FEPS and we have an article on that here. The reflex foam is then layered with other softer foams. It is the foam layers above the reflex foam that you should pay the most attention to understanding their depths and densities is key to fully assess and compare the models you are looking at. There’s an example data sheet for the foams we use that can be used as a comparison to the foams you may encounter. We have a much more detailed article on how to understand depths and densities of foams here. Given that Memory foam, Hybrid or one-sided mattresses can’t be fully turned like a traditional mattress, we have devised a product which minimises this drawback and provides you with a more durable and flexible mattress construction. All of our Hybrid and Latex mattresses come with our dual construction method, not seen in many of the retailers with the exception of Jensens high-end Latex mattress range. This consists of a high-quality hybrid or latex mattress base with a complimenting removable topper. This means that you can rotate and turn the topper when you normally would turn your mattress. The mattresses have been specially created with this in mind to give you not only a superior mattress in terms of comfort, but the option to turn your matching topper and change it later down the line should you need or choose to. What’s the benefit of the dual construction and topper? Quite simply you can turn your mattress topper which should reduce compression and allow you to extend the life of your bed. It also means that in the future should your body weight change, preference for a firmer or softer bed change, you can replace the topper and continue to use the base. It’s far more cost effective to replace this topper than an entire bed. In addition to this, it allows our mattresses to offer more of a progressive comfort when compared to the standard two or three-layer construction methods. The increased depth and layering offers more comfort, as memory foam requires a certain depth, usually 5cm to really provide comfort, something that is paramount. We offer 5cm as a standard depth, compared to 2-4cm in other standard mattresses and on top of this our toppers are also 5-7.5cm meaning you are getting much more mattress for your money. If you compare our mattresses to standard construction mattresses you will see our mattresses range from 25cm (10inch) to 30cm (12inch) across the range. We, therefore, recommend that extra deep fitted sheets are used as they are higher than a standard mattress. Cheaper memory foam mattresses usually start at 15cm overall depth with only 2cm of memory foam. Again, we are providing you with the facts to make your own decision, remembering it is not just the depth but the construction and density of the foams that will determine the suitability and quality of the mattress. Can I use any shop bought topper for this? The simple answer is Yes! But you will again run into a myriad of questions about the quality of topper, materials used, and firmness rating. Here at John Ryan By Design, we have undertaken significant research to match our topper with our mattresses for you and can provide advice on what is suitable for a certain type of mattress. We only sell the highest quality toppers with generous depths to ensure minimal compression and the longest lifespan for the type of bed. 1 – A no-turn mattress is not a benefit, but a requirement of the foam construction method. The softer foam, such as memory foam, sits on top of the reflex foam, firm supportive material, and this makes the mattress one-sided. To turn it would damage the mattress. Don’t be duped into thinking this saves you time. Our range all come with dual construction fully turnable toppers to extend the life of your mattress. 2 -Memory foam and other foams will all compress at some point as they ‘bed in’. It is not always a bad thing providing it is minimal and consistent. The cheaper the material the quicker and more prominent the compression. Minimal compression is known as bedding in. A compression that is over the accepted 2cm amount is known as dipping where the bed has failed you. You should always be looking at 5cm plus for your Memory foam layer so that the compression is minimal. The thinner the layer the more prominent the compression, so a 2cm Memory foam layer that compresses by 2cm will fail to have any purpose! 3 – There’s a huge branding exercise around the material your bed is covered in from infrared to anti-dust mite which has little impact on your sleep, the money they cost is best spent elsewhere. A removable fire retardant polyester cover is fine for a memory foam or latex mattress since it will be covered by your fitted sheets. You can always take this off and wash it as part of your maintenance routine. You are better off spending your money on a decent set of cotton fitted sheets and duvet covers instead where you will feel the benefit. 4 – We recommend that you rotate a no turn mattress monthly if possible to reduce compression. All of our dual construction mattresses come with fully turnable toppers that can be rotated and turned to extend your mattress life. All mattresses should be turned, flipped and rotated where possible. Failing to do so may result in dips, lumps or reduced longevity for your mattress! 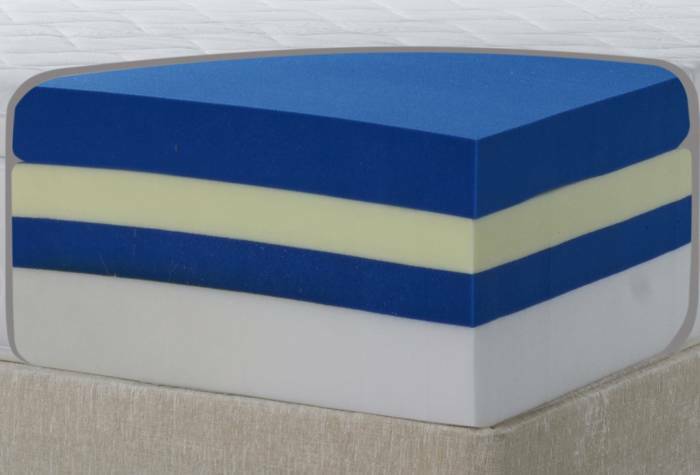 The very construction method of foam mattresses means that 99% of them are one-sided, with the exception of solid core latex such as our Fusion range. Foams, like all upholstery, will compress and settle over time. The accepted amount is 2cm. This means that rotating the mattress monthly and the inclusion of a topper are essential to keep the mattress in prime condition as long as possible. If you don’t rotate and keep sleeping in the same spot the likelihood is you will end up with indents that you then can’t remove. Call our friendly team if you need more foam mattress help.